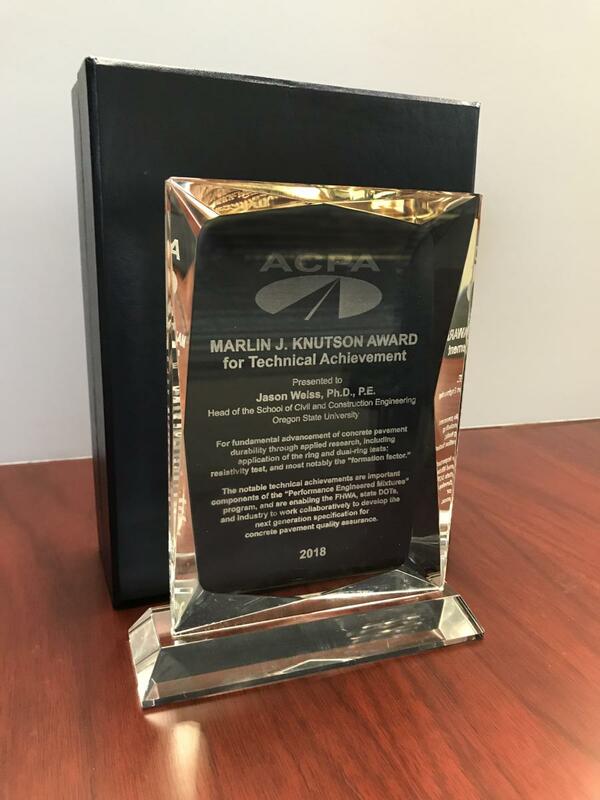 The Marlin J. Knutson Award for Technical Achievement is presented to an individual or group who has made significant contributions to advance the development and implementation of technical innovations and best practices in the design and construction of concrete pavements. ACPA presented the 2018 Marlin J. Knutson Award for Technical Achievement to Jason Weiss, head of the school of civil and construction engineering at Oregon State University. Weiss was recognized for fundamental advancement of concrete pavement durability through applied research, including application of the ring and dual-ring tests; resistivity test, and most notably the "formation factor." Some of Weiss' notable technical achievements are important components of the "Performance Engineered Mixtures" program, and are enabling the FHWA, state DOTs, and industry to work collaboratively to develop the next generation specification for concrete pavement quality assurance, according to ACPA. This award is named in honor of the second chief executive of the American Concrete Pavement Association. Knutson served in that role from 1985 to 1998, and during his tenure, was a staunch advocate for technical service and technology transfer. The Knutson Award for Technical Achievement has been awarded annually since 1998.